Melvyn Bragg and guests discuss the 1683 siege of Vienna by the Ottoman Army. The ensuing tale of blood and drama helped define the boundaries of Europe. 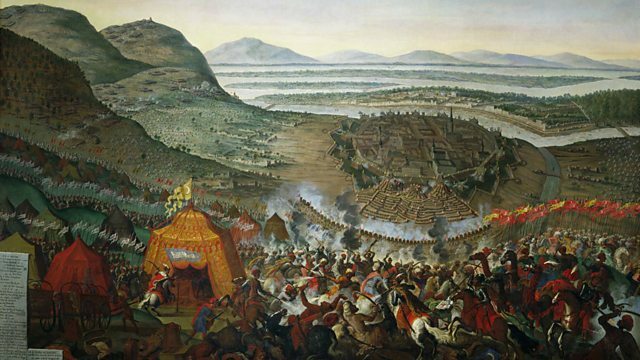 Melvyn Bragg and guests Andrew Wheatcroft, Claire Norton and Jeremy Black discuss the Ottoman siege of Vienna in 1683, when the Ottoman Empire tried to capture the capital city of the Hapsburg monarchs. The ensuing tale of blood and drama helped define the boundaries of Europe. In June 1683, a man called Kara Mustafa made a journey to Vienna. That a Muslim Turk should come to a Catholic city was not unusual, but Kara Mustafa did so at the head of the Ottoman Army. Vienna was the capital of the Hapsburg Empire and he intended to take it. The ensuing siege has been held responsible for many things, from the invention of the croissant to the creation of Viennese coffee. But most importantly, it has come to be seen as a clash of civilisations, one that helped to define a series of boundaries, between Europe and Asia, Christian and Muslim, Hapsburg and Ottoman, that influence the view between Vienna and Istanbul to this day. But to see the siege as a defining moment in east/west relations may be to read back into history an idea that was not true at the time.Claire Norton is Lecturer in History at St Mary's University College, London; Andrew Wheatcroft is Professor of International Publishing at Stirling University; Jeremy Black is Professor of History at the University of Exeter. Browse the 17th Century era within the In Our Time archive.